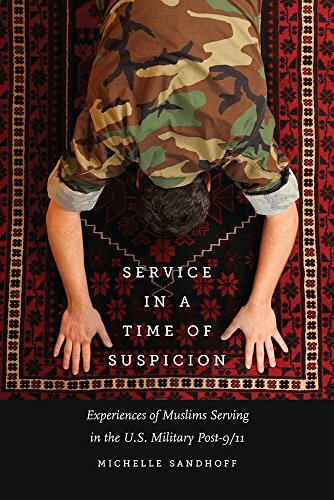 Michelle Sandhoff, an assistant professor of sociology at the University of Pennsylvania, has written a short, concise research-based book about Muslims in the military, and it is worth reading. Most Americans are aware that life in the United States changed for Muslims after 9/11. Discrimination, distrust, and negative experiences became common—and still are—for Muslims in this country, and servicemen and women were no different. Sandhoff brings this uncomfortable conversation directly to our military and asks penetrating questions of the Muslims who wear the uniform. Her research consisted of 15 men and women in various branches of the military, both active-duty and veterans. She understood before beginning the project that the post 9/11 backdrop would prove to be especially relevant and complicated for Muslims in the military, not only because of the sudden scrutiny that people of that faith were under, but also because the War on Terror led them to serve in countries where Islam was the predominant religion. The basis of her research then, was how these men and women in uniform would fare taking into account the political and religious turmoil of the country, as well as the inherent diversity of the United States military. The answer: both, depending on the attitudes of the unit-level leadership. Another big obstacle Sandhoff finds Muslim military members face is religious accommodation for duties such as prayer, fasting, and attending congregational prayer such as Friday prayer and Eid. Depending on the commander and other unit leaders, the Muslim in question may get time off for these religious obligations, or may not. One veteran told that he and 15 others were only able to go for Eid prayers off base after a rabbi intervened on their behalf. Others found more flexibility in terms of fasting and prayer because their unit leadership were aware of the importance of religious diversity and allowed them accommodations. Immediately after 9/11 and for some years later, veterans described an extremely hostile environment in some cases. One man was called unpatriotic, questioned thoroughly, and even followed. Others did not have such negative experiences, but almost all reported a sense of discomfort. Sandhoff explains the term “contact hypothesis” to mean that negative attitudes about people in conflict can be resolved through communication and understanding. Basically stated, it implies that if you get to know someone you will stop believing stereotypes. Two men surveyed offered classic examples of contact hypothesis in the way they worked in the military. Both were able to build bridges in Afghanistan by talking with the locals and showing the positive side of Americans through the sharing of his own experiences. Their being Muslim and from a South Asian background, they were able to build a rapport and conduct peaceful missions while other army units deployed in Iraq and Afghanistan were not. Similar experiences of military men and women on bases who taught voluntary classes on Islam and in other ways offered themselves as subject matter experts helped educated their colleagues and even in many cases their supervisors. This was seen in a positive light by both the military organization as well as the serviceman/woman. Books like Sandhoff’s offer a rare glimpse into the military establishment and how it treats people who are marginalized by the mainstream American public. The War on Terror has had a lasting effect on all American Muslims, and perhaps more so on Muslims who serve our country with pride and loyalty. This book answers, more than any other book, what it means to be an American and a Muslim.